Hide your women and children, because it's World Poker Blogger Tournament time! This is the third year I have participated to some extent in the goings-on. The shenanigans started last night. I briefly met up with a bunch of the degens at the Excalibur. We then moved over to the Palms poker room. Several of us had agreed to try to get the Palms to spread a low-stakes HORSE game for us, but most of those who said they wanted to play never showed up, apparently getting lost between the two venues. I really have no idea what happened to them. So as an alternative form of entertainment, I and several other blogger types joined the regular Thursday night Pokerati game. I have played this twice before, losing both times. (See here and here for the sad stories.) Apparently, though I am demonstrably a slow learner, I am capable of some improvement--or at least occasional luckboxing to success--because I managed to pull out a $242 win last night. Most of the profit came from making two big calls against two inveterate bluffers, both of them in situations in which I probably would not have called players with more solid table images. One of them was with just top pair in hold'em. The other was ever scarier, with just top and bottom pair in PLO when there were three possible straights on the final board. Fortunately, I was correct both times. It's a challenging game, and the competition last night included a bunch of people who are more experienced at PLO and/or much more willing to gamble than I am, making for a tougher environment in which to make money than I usually encounter. But it turned out to be both fun and profitable. I don't know what more I could ask from a poker session than that. Next up: Mixed-game hijinx tonight at Aria. A friend wrote me for advice on playing an unusual poker tournament. He has apparently managed to get himself invited to a game set for the casino's high rollers, who mostly play table games and slots, not poker. What's the best way to approach such a tournament, he wondered. If I were playing a tournament against a bunch of people who didn't know much about poker, my expectation would be that they will play way too many hands, stick with them way too long, and be way too passive. I would expect them to check-call over and over and over again. Playing too many hands, and calling when either folding or raising would be better, are the primary sins of novice players. I would also expect them to have no concept of how their stack size should dictate how tight/loose they play, when they should shove, etc. Finally, if they're all on a freeroll, being given tournament entry as a gift or reward from the casino, I would expect them to place no mental or emotional value in getting anything out of it monetarily. That is, they're not going to be trying to maximize value by playing aggressively to try to take the top prize, nor are they going to nurse a short stack hoping to just survive to the money. Put another way, I would expect them to play without regard for what stage of the tournament they're in. So how to adjust for such players? Well, the obvious thing is to pretty much abandon bluffing. They are going to be playing based on what they perceive the strength of their own hand to be, not based on an assessment of what you have, because they have no idea how to figure out your range. They probably don't even have a mental concept of what an opponent's "range" means. As a result, they can't follow the story you're trying to tell with a cleverly executed bluff. I would not expect most bets to induce folds. I would assume folds were going to have very low fold equity. That means that you should not bother making a bet or raise if the situation is one in which the usual goal of a bet would be more to induce a fold than to build a pot that you expect to win. That means that you'll be making fewer bets and raises than usual, but that's OK. If you're playing tighter than your average opponent, then you will usually have the better hand. Since you're going to have to win at showdown a higher fraction of the time than usual (because you're not going to get them to fold), that is just what you want. There are also implications for your short-stack game. Usually you'll shove with any semi-decent hand if action is folded to you and you have 10 or 12 big blinds or less. I would be much more cautious about that with this group. They look down at a pair of deuces or a J-10 offsuit or a suited 4-5 and figure it's pretty, I might as well call. Again, the idea is that you can't expect to have the same amount of fold equity that such a shove usually carries. When you have to shove, it should be with the expectation that you'll get called and have to win a showdown, not that you'll be happy to just fold the field and pick up the blinds and antes. That obviously means shoving with a narrower range than would be your usual approach. It may well mean letting your stack drift down lower than you would usually allow before you find a hand that's strong enough to expect to win a showdown against the loose range with which you'll likely get called. I think I would also mentally prepare in advance for bad beats. Rehearse how you're going to be cheerful and friendly and join your opponents in applauding their wins when their stupid play gets rewarded with the perfect river card. Mike Caro always plays with the attitude that he's rooting for the opponent to win. If that doesn't happen, he gets the pot as a consolation prize. That way, he's never disappointed either way it turns out. It's a hard mindset to get into, but one that is a harmonious environment for avoiding tilt. One final piece of advice: I can no longer remember who wrote it (I think Steve Zolotow, but I can't be sure), but there was a column a few years ago in Card Player magazine about playing in a juicy home game. He stressed the point that one's most important goal for the first game is NOT winning any money, but getting invited back for a second and third and fourth game. You do that by being a good sport, by being likeable, by giving lots of action, chipping in generously for the food and drinks, and being a good loser. I get the impression that this tournament is one to which you are being invited at the discretion of its organizers. If so, I would make it my first priority to catch their attention as somebody that should be invited back every time because you help make the experience more enjoyable for the high rollers they're trying to woo. Laugh, learn people's names, makes friends, be the guy that nobody much minds losing to. Imagine yourself as part of the casino hospitality staff, there to help the other players have a good time so that they want to keep patronizing the establishment. In other words, take the long view, not the short view. You're trying to set the stage for being able to sheer these sheep many times, not just kill them this once. None of this is mathematically precise poker theory, but I hope it's a useful set of broad strokes on how to approach the game. And I missed it by a long way. It was 30 days ago, and it was just today that I realized that I've been doing this bloggery thing for five years now. I don't have anything profound to say about the passage of that interval of time. To use my girlfriend's favorite (hah!) expression, it is what it is. But I thought I'd point it out anyway. Yesterday I was planning to spend the afternoon playing at Imperial Palace, but they had no game going when I arrived, so I wandered down the street to the Flamingo, where I had not played since (hang on, checking records) December 16, 2010. I generally don't like it much there, but it will do in a pinch. Sometime recently they opened a new casino. Well, it's really just an extension of the main Flamingo casino, but it is set up in such a way that it looks and feels like it's separate. It's the "Margaritaville Casino." It's tropical-island-themed, with cocktail waitresses in bikinis, Jimmy Buffet music playing overhead, clusters of faux palm trees, etc. It's actually very pleasant, as casino floors go. To celebrate the opening, they issued new chips, as shown above, which, of course, I had to add to my collection. I was one of the players starting up a new table, and quickly discovered that I had lucked my way into an assemblage of calling stations. Instead of my usual game, I switched to what I think of as my "Bill's strategy," named for Bill's Gamblin' Hall and Saloon, which was the first place I found myself consistently facing a table full of people who would call anything, fold nothing, and be aggressive only with the nuts. The strategy is not exactly rocket science: Value bet the strong hands, check-fold everything else, omit the bluffing. Against such opponents, it does not matter that that strategy means that you are effectively playing with your cards face up. They don't bother looking at them; they see only their own cards, and play accordingly. The Bill's strategy was paying off well, supplemented by stacking a guy when I had the good side of a flopped set-over-set (my queens to his treys). It was getting close to the time that I needed to leave to catch the start of the Sunday night IP mixed game, when there was a touchdown in the late football game, which meant it was $100 splash-pot promotion time. They drew a card to determine which table would get it, and mine was the one. Next hand, the floor guy brought over 20 red chips and plunked them down in the middle of the table before the cards were dealt. I was in the big blind and got A-8 offsuit. My expectations were low. My limited experience with splash pots like this is that people go crazy, like a school of sharks in a feeding frenzy. FREE MONEY! ME WANT! Players raise and reraise crazily, shoving stacks of hundreds of dollars into the pot in an effort to win the house-supplied overlay. Not this time. It was a family pot limpfest. 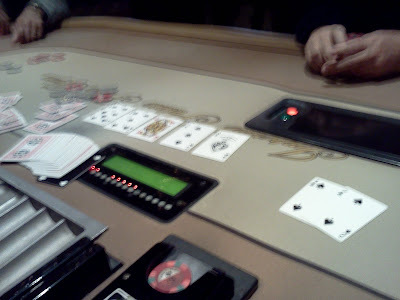 I was stunned as one by one they all dutifully set two blue chips out in front of them. There was no discussion, no collusion, no collective strategy being deployed. I thought surely somebody was going to put in a raise that I would consider prohibitively large, given that my hand was one that was very likely to be dominated by somebody with a better ace, leaving me with, at best, maybe a 25% chance of winning the hand. With my nice profit for the afternoon about to be locked up, I wasn't in a mood to monkey around with a big chunk of my stack trying to get lucky with odds like that. As the number of limpers increased, it dawned on me that these people simply could not figure out how to adjust to the radically different situation that the splash-pot promotion was presenting them. There is a very good reason that in no-limit games bet-sizing has everything to do with the size of the pot: You need to figure out what the pot is worth in order to determine how much it's worth risking in order to win it. As extreme examples, it usually would made no sense to risk $100 to win $2, but it would almost always be worth risking $2 to win $100. When the pot starts at $103, as this one did, a player who thinks he likely has the best hand--or thinks that he can convince everyone else that he does--should make a stab at the pot that is many times more than what the standard opening raise would be when just the $3 in blinds is up for grabs. But when the action got to me, it was still just the size of the big blind I had already posted, so heck yeah, I'll take a free flop. It came ace-rag-rag. The small blind checked. I thought about what to do. This table was so passive that there was a real chance that all ten of them would check. A pot now at about $115 (after rake) was absolutely worth taking a shot at with top pair, even with--or maybe especially with--a flock of calling stations behind me. But how much to bet? I did not have great confidence that I had the only ace, and with ten limpers, there could easily be some weird two-pair that had hit and that might remain undetectable until I had committed a lot of money. Especially with my bad position, I didn't want to spend a lot and then have to abandon my children in the middle of the table. It seemed to me that all of the other players were not perceiving this as a $115 pot. Instead, they were seeing it as a $15 pot with a $100 bonus going to the winner. Of course, logically that is a distinction without a difference. But perception is a fair substitute for reality in such situations, and I decided that I would play along with the table's apparent conventional wisdom. I also had in mind the general axiom that one should not bet more than it takes to accomplish the goal, which in this case was, ideally, to win the pot uncontested, and, failing that, to determine where my hand stood in relation to the strength of the others. If the other players are seeing this as a $15 pot, then it makes no sense to bet $60 or $70 at it. So I bet $10. Frankly, this seemed like an absurd thing to do. I can state categorically that I have never opened the betting at a $100+ pot for $10 before yesterday. But I was in Rome, and doing what I thought the Romans do. Like a row of falling dominoes, the players tossed in their hole cards one after the other, and I won a $115 pot with my little $10 bet. I have no idea why this bunch of calling stations--who previously would call three streets of 1/2- to 3/4-pot bets with top pair/bad kicker or second pair/good kicker--all suddenly decided that less than 10% of the pot was too rich for their blood, but that's how it went down. Sitting here describing it and watching the replay in my brain, I'm still dumbfounded. None of it makes any sense from the point of view of a rational poker player. It may be that I was the only one at the table that might be able to claim that label. I can't remember ever reading advice on how to handle a situation where your opponents think the pot is different than what it really is, because this must surely be a situation that comes up only rarely. I won't claim that being able to figure out what your opponents think the pot size is will be a skill that you need very often, but apparently it's one that can come in handy at least once in a great while. Playing at Imperial Palace tonight, I had the above nice hand: runner-runner 5-high straight flush, starting with 2s-4s in my hand. I won the pot plus a $100 high-hand jackpot. The dealer was Alaska Gal of AllVegasPoker.com. It was sort of a spontaneous mini-AVP meetup, with TarpieFish and Karapet1 also at the table. I believe that I made a few converts to the Holy Order of the Deuce-Four with that hand. I would tell more stories, but I promised Tarpie that I wouldn't tell certain stories. For example, the time he mucked his cards when first to act on the river, only to have his lone remaining opponent show him 5-3 offsuit, which was the worst possible hand for the board, meaning that whatever Tarpie threw away, it was the winner. That's one of the stories I said I wouldn't tell, so I won't. See how faithfully I keep my promises?